Cueva de las Manos, Río Pinturas, is a cave of archaeological and paleontogical importance. The Cave lies in the valley of the Pinturas River, in an isolated spot in the Patagonian landscape. 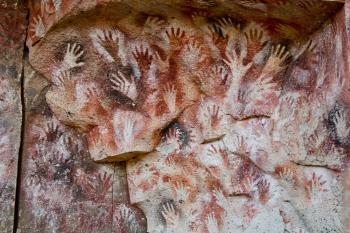 It is famous (and gets its name) for the paintings of hands, made by the indigenous inhabitants (possibly forefathers of the Tehuelches) some 9,000 years ago. This is not an easy place to get to but I did not regret the effort to get here. If you have your own car, then you can drive here on your way between other parts of Patagonia. For me, I found a tour operator that stopped here between Puerto Madryn and El Calafate (two other WHS). The caves here are incredible and it's likely you'll almost have the place to yourself. The hand paintings are really vivid and you can get quite close to them. When you travel in Patagonia you will get to see endless plains, some hills, plenty of bushes and almost no trees. Over time the landscape feels quite monotonous, especially if you are spending days (and nights) on busses and cars traversing it. As such, going to Cueva de los Manos was a great stop. At first it looks like all the surroundings. I even wondered why humans settled here in the first place. 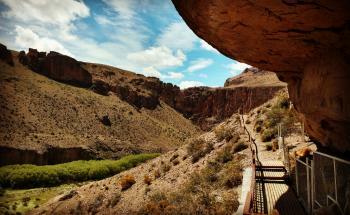 And then a lush, green canyon pops up, the canyon of Rio Pinturas. It’s an oasis and you understand why early humans came here. 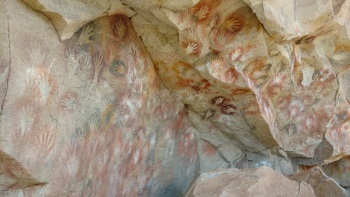 Their primary legacy are rock art paintings, specifically hands with the most famous one having six fingers. The site lies along Ruta 40. If you are travelling by car you can go simply turn off the highway. Note that it’s still quite a distance from the main road on a steep and pretty much terrible gravel road. This probably also stands in the way of hitchhiking here. There are daily busses to Los Antiguos/Perito Moreno from Esquel (Los Alerces) and at least bidaily ones from El Calafate or El Chalten (Los Glaciares). Having made it to Perito Moreno, though, doesn’t really help as the actual site is still a 1,5h drive away. Seeing I was short on time (I only wanted to stay one night in sleepy Perito Moreno), I arranged for a tour to pick me up at the bus stop. There are two tour operators I found online operating on alternating days: Chelenco and Zoyen. Both run tours from the more touristy Los Antiguos via Perito Moreno to the site. While Zoyen did not bother to reply, Chelenco were very helpful, but also very expensive charging 90 USD. I felt this was a bit much for a group tour with maybe 3h transfer in total and 3h on site and that included a way too generous lunch break and some organizational hickups. Finally, they forgot the lunch box that was supposed to be part of the price. Unfortunately, there aren’t all that many tourists, so you probably have little choice. Lonely Planet claims you can get a tour/taxi in Perito Moreno for as little as 50 USD. Same price as mentioned by Jarek. But I was short on time and frankly didn’t see any hints in Perito Moreno that such a thing existed. It’s probably best to contact the site, the tourist information in Perito Moreno or your hotel to check what they recommend. Site visited in March 2012. All prices were valid at that time with utilization of official peso - dollar rate of exchange. Currently you can exchange your money on black market when rates are much more convenient. In March 2012 it was extremaly expensive place (like the whole Argentina), normal entry ticket costs 50 ARS (which is around 12 USD) but as it is located in remote area (no public transport) you should combine that with an organised trip (from nearby Perito Moreno town the trip costs 220 ARS per person, around 50 USD). If you don't want to stay in Perito Moreno overnight (the place itself has limited accommodation, especially on weekends !) this should be planned carefully - there are limited transportation between Caleta Olivia (on the coastline) and Perito Moreno as well as on legendary Ruta 40. I have visited the caves in 1973. Just after a broken axle of the car which I bought in Buenos Aires. My wife and I found the place through some local people we met. We had to travers a river, the rucksack on my head because the water was too deep. It was a marvelous experience to see the cueva de los manos because it was only discovered in 1972 I guess? "Cave Man" sites: "contains an exceptional assemblage of cave art, executed between 13,000 and 9,500 years ago. It takes its name (Cave of the Hands) from the stencilled outlines of human hands in the cave, but there are also many depictions of animals, such as guanacos (Lama guanicoe ), still commonly found in the region, as well as hunting scenes." In private ownership: AB -"Both the site and the buffer zone are within the property of a private individual, who has signed an agreement consenting to the declaration of her land as a World Heritage site"